If you're in the mood for some good, hearty food, this is the recipe for you. There is nothing like a delicious chicken parmesan — and this recipe with the Anova Sous Vide Precision Cooker doesn't disappoint. Season the chicken with salt and pepper and place in a large zipper lock or vacuum seal bag. Seal the bag using the water immersion technique or a vacuum sealer on the dry setting. Place in the water bath and set the timer for 1 1/2 hours. About 5 minutes before the chicken is finished, prepare the dredging mixtures: Place the flour in a shallow bowl and season with salt and pepper. Crack the egg into a second shallow bowl and beat until well-combined. In a third shallow bowl, combine the panko and the Parmesan cheese. Heat the broiler to high. Line a broiler-safe baking sheet with aluminum foil. Place the chicken in the bowl with the flour and toss to coat. Dip the chicken into the bowl with the egg, and then transfer to the panko. Toss to evenly coat. Transfer the chicken to prepared baking sheet. Broil until golden brown, 2 to 5 minutes. 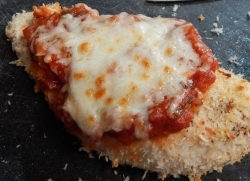 Top chicken with marinara sauce and then mozzarella. Broil until cheese is melted and browned, 1 to 3 minutes. Serve over pasta or with bread.